Sticky notes leaving you stuck? Productive teams can use our brainstorming board template to organize thoughts and turn ideas into action. Brainstorms get the creative juices flowing to find that great idea or solution for your next project. Sadly, that’s as far as many ideas get if they aren’t tracked or the context is forgotten. Not to mention the difficulty for remote teams and the time spent organizing and transcribing ideas. 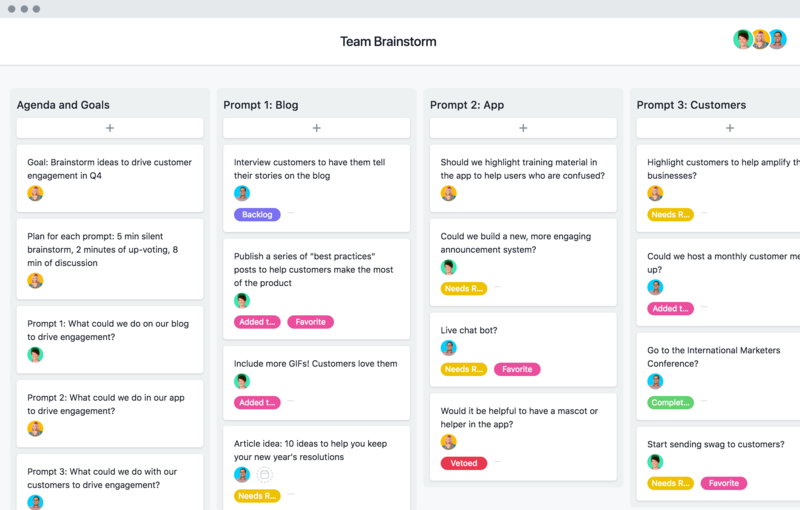 If you start with our brainstorming board template, everyone can add their ideas all at once (like a collaborative doc) and provide details so their idea is crystal clear later on. Then if you action the idea, it’s already in Asana for you to get right to work on. Use the template, and these tips, for your next brainstorm. Annotate and transcribe notes. If your brainstorm is on stickies or whiteboard, take a photo with your mobile device and our app will let you transcribe and annotate it. Get great ideas, without all the meetings. Share your brainstorm with teammates so they can keep adding ideas anytime, anywhere. Organize your ideas by theme. Our template makes it easy to group your ideas into buckets, and tag them so you can see patterns and themes emerge. Add context. Two words scribbled on a sticky note might not make sense next month. Instead, you can add context to each idea, attach files, and even reference other work you have in Asana. When it comes to brainstorming, Asana can keep ideas actionable and replace whiteboards and sticky notes. What can teams do to prevent a bad brainstorms and run more effective brainstorms? From idea to final asset, Bobbi Brown’s creative operations team relies on Asana to execute global campaigns. The only thing better than a great idea, is making it reality. Keep your ideas organized with Asana Premium.